Take a look in your server room. What do you see? Rows of blinking lights? Yes. Boxes on racks? Absolutely. Take a closer look. The heralds of a handful of companies who have fought for (and won) your business. These technological kingdoms have veritable armies behind them, marching their way into your business infrastructure. And you are both their masters and their thralls. 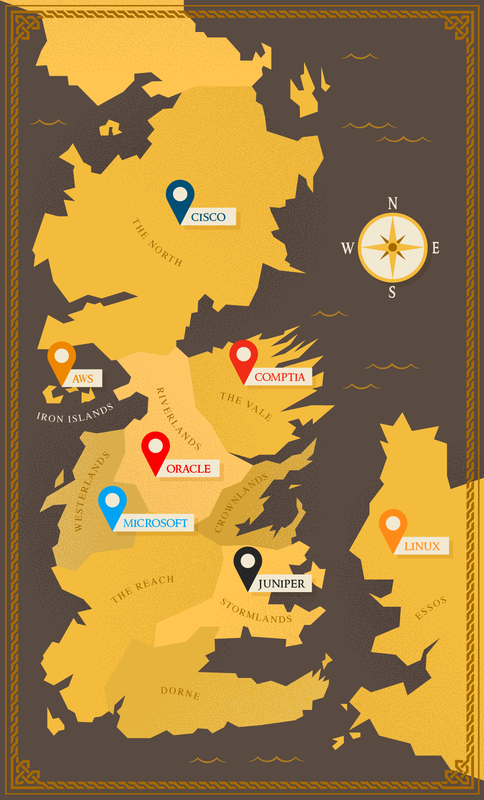 Here’s how we envision the IT vendors if they were Game of Thrones Westeros Houses. When everything is running smoothly, you barely remember the Starks up in Winterfell, being all noble. They’re an old house and one that’s essential for stability in the kingdom. They’re truly the base of the entire infrastructure of Westeros, which happens to be the exact role Cisco plays in your network. Everything relies on them keeping the order of the realm. As an IT pro, you know that when Cisco fails, everything falls apart. Juniper has the third largest market share in the world of routing and switching. For many people, Juniper is their choice. For many others, it is not. That’s why we think Juniper is House Baratheon to Cisco’s House Stark — in the earlier days of routing. Baratheons are new to power, however. And with great power comes great responsibility. While many people assert that Juniper has a superior Linux-based product, others rely on the truly powerful leader in the market. Just like House Frey, you often don’t even think about Oracle until you reach their lands. For this reason, they have certain strategic advantages. As you’re marching toward your destination, sometimes you find an Oracle database. It’s old but still strong. A long time ago, someone made a deal with Oracle. That person wedded your data to their database, and now you’re beholden to the House of Oracle. It’s so integrated with the system that it’s impossible to find a workaround. In which case, you have no choice but to pay tribute to the old house. For perhaps obvious reasons, Microsoft is House Lannister. They’re rich, smart, and brutal. They’ve managed to marry into every house of power. Though it might seem attractive to marry into the House of Lannister for their money and influence, you’ll soon find that what they want is power. Once Microsoft is married to your system, they’ll force your hand in many ways. With ever-shortening support windows, they’ll force you to upgrade. If you don’t upgrade, they’ll bother you until they get their way. They’ve even recently found a way to monetize open source technologies. Across the narrow sea, the Free Cities had their troubles even if they weren’t torn apart by the War of the Five Kings. No. They had their own issues, namely Daenerys and her dragons. But, by and large, they remain self-governed and powerful. They’re the world’s greatest traders, with great fleets of ships transporting goods all over the known world, just like Linux. In the great Cloud War, containers have emerged as the superior way to virtualize any function — unleashing the power of a Linux kernel. Even the old houses have taken notice, and they’re scared enough to make alliances to avoid being slain. Living on rain-soaked islands away from the wars, the Ironborn have a real chance to gain their independence with the help of the Free Cities. The warmongering, seafaring people hail from a long tradition of doing things differently — and no one will tell them what to do. Similarly, AWS hails from a rain-soaked region and once rampaged across the sea to claim their independence from Oracle. In the process, they might just take over the entire kingdom. The final similarity: We imagine there will be something similar to a Kingsmoot once Jeff Bezos eventually steps down. Like the CompTIA and its vendor-neutral training, The Vale of Arryn both remains neutral and supports those who can make it up to their keep. CompTIA looks down upon the Seven Kingdoms, taking no sides, but it doesn’t mean they’re weak. Want to draw your own connections to the world of IT vendors? Learn more and start your free week of IT training with us now. CBT Nuggets has everything you need to learn new IT skills and advance your career — unlimited video training and Transcender® Practice Exams, Virtual Labs, validated learning with in-video Quizzes, Accountability Coaching, and access to our exclusive community of IT professionals.